What Is the Function of a Pig's Small Cloven Hooves? Webster's New World College Dictionary says a hoof is not just the upper coverings of an ungulate's foot but also "the entire foot of such an animal." But hooves are distinct from feet in a number of ways -- notably the lack of opposable digits. Hooves are either cloven or uncloven. Cloven hooves, such as those found on pigs, sheep, cows and goats, are divided into two digits. Uncloven hooves, such as those found on horses and hippos, are solid. The two main digits, called claws, of a cloven hoof are analogous with the third and fourth digits on the human hand. Uniquely, pigs retain two well-developed digits just alongside the hoof. These digits do not play an important part in the function of the hoof but are a relic from a historical period when pig ancestors had feet instead of cloven hooves. While horses are capable of reaching high speeds with majestic grace, their uncloven hooves do not permit a high degree of dexterity. Pigs in the wild, meanwhile, benefit from having two digits -- they promote better balance on uneven terrain. The small cloven hoof of a pig permits a degree of balance shifting, where the pig rocks his hooves slightly to adjust weight distribution. Hooves have served an evolutionary function, too. They lengthen animals' leg, enabling them to run at higher speeds and walk on their toes. You can observe a direct correlation between the habitat of an ungulate and the anatomy of the creature's claws. Animals who live on solid and flat land, such as horses, zebras and hippos, do not require the balancing capabilities of multi-plate claws. Animals who exist on softer or uneven ground such as muddy fields and marsh benefit from having two claws. 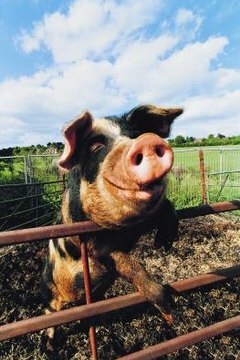 Pigs, hogs and boars have evolved from having four-digit hooves to having two-digit hooves. Over time, the use of the two outer digits declined as the animals learned to use their center digits for weight bearing in soft ground. ce on other animals denotes “devilish” behavior. Jewish dietary laws are in part determined by the function of the hoof. Cloven hooves signify an animal is not unclean or not kosher. Animals who have cloven hooves and chew kud are considered kosher. What Animal Other Than a Primate Has Fingerprints?